We all like to give our plants the best start in life. This will, in turn, produce a healthy, strong and ultimately, happy plant. We choose a suitable setting for them, taking into account their native temperature, light requirements, water and nutrient needs. Within the world of nature, there are some aspects that we cannot control and despite our best intentions plant pests and diseases are one of the aspects which can occur quite suddenly, cause mass devastation and be tricky to treat. 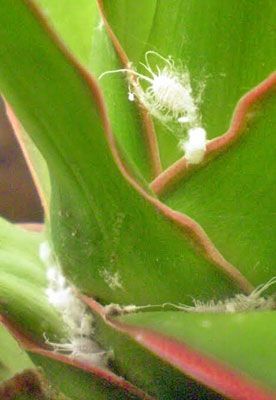 Today, I want to talk about the most common destructive pests within the houseplant Cacti and Succulent world. In many cases, your most valuable weapon against these nasty pests is knowledge – becoming aware of what to look out for, how to identify them and furthermore, how to eradicate them. Let’s start with the woolly-looking Mealy Bug…. This is a common pest which can often be brought into the home, through the addition of new plants. It is a good preventative measure to always have a period of “quarantine” for any new plants, before introducing them to the rest of your collection. The Mealy Bug belongs to the Pseudococcidae family and is a small sap-sucking insect of 3 – 5mm in length. They look a lot like a miniature wood louse with a white powdery coating. 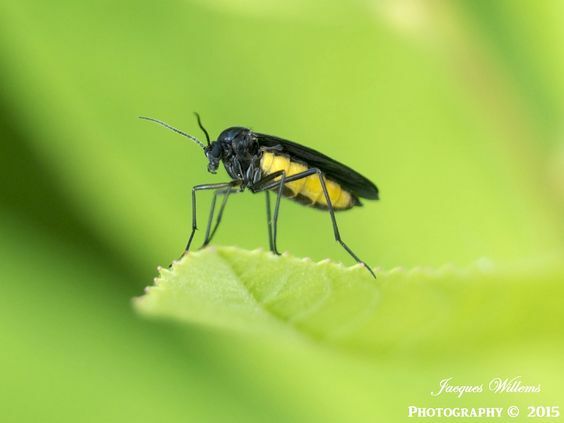 In early infestation, these bugs tend to be solitary insects which quietly go about their business of extracting foods from the tender tissues near the growing point of your plants. As the infestation develops, it is easy to see little nests appear. These resemble small patches of cotton wool in which the bugs lay their eggs to hatch and begin growth. Eventually, large numbers of these insects will be prevalent, especially at the growing tip of your plants where they like to congregate. The Mealy Bug can cause massive damage, fairly quickly by their extensive feeding. In smaller plant collections, it is easy and important to regularly check your plants. For small infestations, use a fine paintbrush dabbed in methylated spirits and paint these onto the bugs. This will dissolve the bugs white coating and should eradicate them. For heavier infestations, it is better to use a systemic insecticide on your plants. 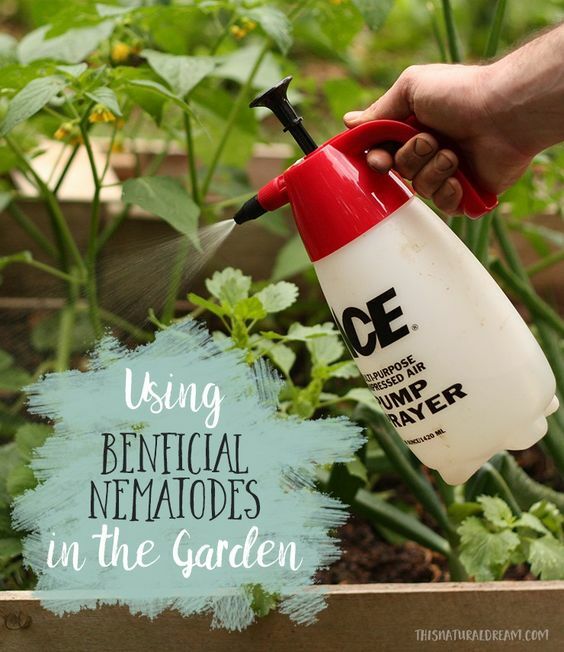 This comes in the form of a spray which you use on infected plants and potting compost. The plant absorbs this insecticide, which makes the plant sap poisonous to the Mealy Bug. Unfortunately, regular use of the insecticide can allow the Mealy Bug to become immune to its toxic properties. The Root Mealy Bug attacks the roots of the plants, and can therefore do a lot of damage before you have even recognised there is a problem. For this reason, I always use a preventative measure of re-potting new plants before adding them to my plant collection. This enables me to have a good look at the roots and compost for the minute thin grubs which look like the Mealy bug, but are much smaller. A similar use of methylated spirits can be quite successful, but it is worth knowing that unless all of the pests are killed, they will soon recolonise in the pot’s contents. 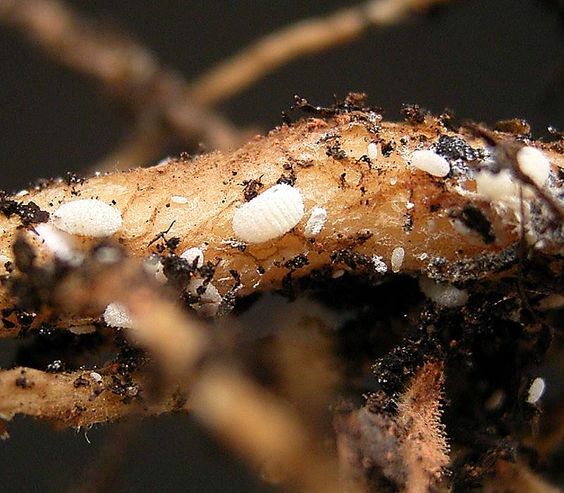 Alternative treatments for the Root Mealy bug are soil insecticides. These come in granular or liquid form and can be added to your new compost mix, or stirred into the soil of an existing, more established plant. Rather than being a spider as the common name suggests, this almost invisible, miniature creature is actually a sap-sucking mite. Due to its tiny size, it is difficult to spot and infestations can reach plague proportions before it has fully gained your attention. 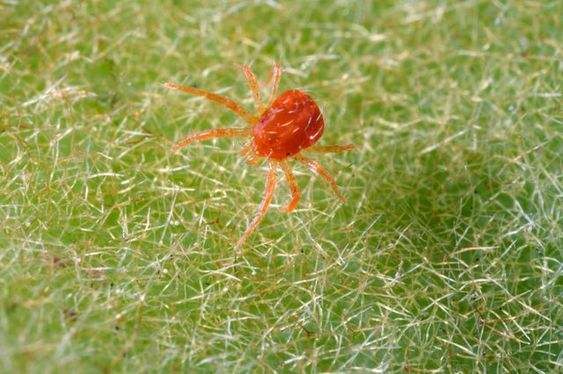 The Red Spider Mite finds the perfect environment in dry and warm growing conditions similar to those of the cacti family. Their presence is often firstly shown by a browning and later, webbing of the plant body near the growing point. Unfortunately, by this point though, it is usually too late to avoid a permanent marking of the infected plant. If you think you have a problem with this plant pest, close inspection with a magnifying glass should confirm your suspicion. Since this mite is a sap-sucker, the best solution is to use a systemic pesticide which specifies protection against Red Spider Mite. Spider Mite are pretty resilient to sprayed contact pesticides and may grow immune over time to the same systemic pesticide, so be sure to use different types if you can. Since the popularity in peat-based composts has grown, so has the commonly known Mushroom Fly. This pest thrives in moist conditions and will lay its eggs at the base of the plant stem, where they hatch into almost transparent, tiny grubs. These grubs will feed on decaying plant material and the plants themselves. In time, the Sciarid fly will eat inside your plants, chewing into the plant base and working its way upwards, leaving a hollow plant shell. Be aware that seed germination conditions are just perfect for the Sciarid fly to do its worst, an infestation can easily destroy a crop of young seedlings. 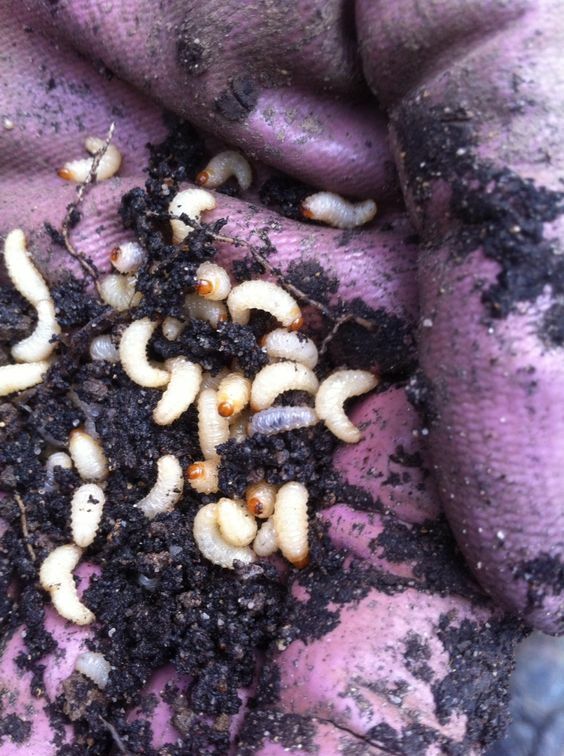 The grubs are very small in infancy and can be hard to eradicate from soil and compost. Your best form of attack in this case, is to use a systemic or contact insecticide which can either be sprayed or watered into the compost mix. Adult flies can be spotted and easily sprayed with the same insecticides, which should eradicate them. It is the grubs of the Vine Weevil which cause the most harm to your plant collection. 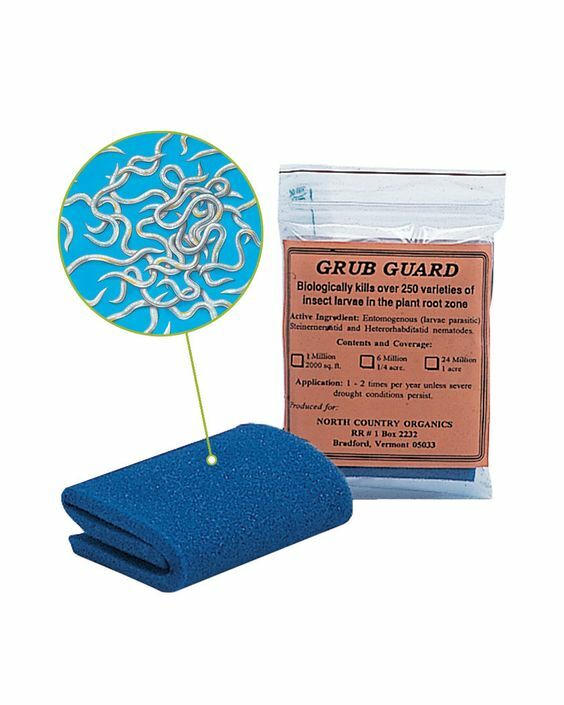 These grubs bore into the stem bases of succulents and feed on the plant roots. Those plants particularly susceptible to attack are those in the Crassula family. Unfortunately, it is often when an infected plant topples over, that you realise you have a Vine Weevil problem. The adult Vine Weevil is easier to spot, these will eat the leaf margins of succulents such as Echeverias. Firstly, have a look at the pot contents of infected plants. It should be plain to see the wriggling white larvae within the compost mix. These can be squished and an effective soil drench treatment should be applied to all plants under attack. These treatments are available from your local garden store. 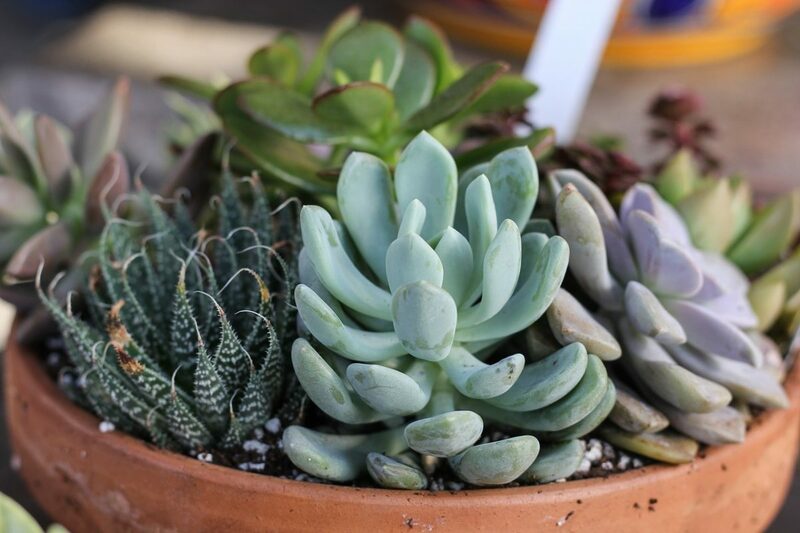 The succulent plant most affected by the Thrip pest is the Lithop family. 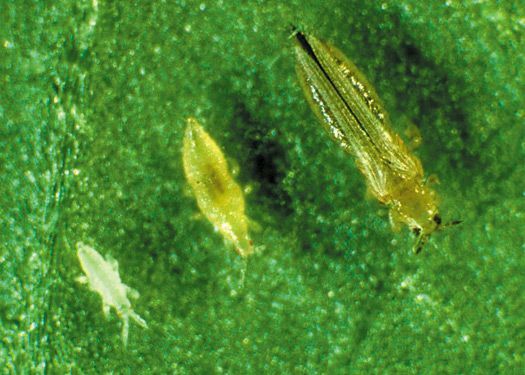 These tiny pests are only around 2 – 3 mm in length but have mouthparts which scrape and puncture plant tissue, allowing the gradual feeding on wounded plant sap. They also tend to spend much of their time in cacti and succulent flowerheads where they damage petals and cause a distinct marking on the soft bodied plants. Western Flower Thrips, although tiny, quickly gain access to the new growing plant head, especially when the Lithops are in flower. They work “en masse”, congregating in the flower head, eating both pollen and attacking soft tissue of the new growth. It is often not until the following year that you notice the attack, when the damage becomes apparent on new growth. Above is a photo of the different stages of Thrip larvae. Adult Thrips are easy to spot, take a look at the photo below.. 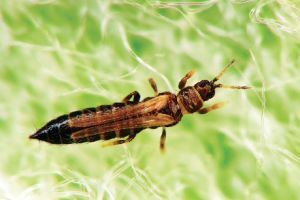 This particular pest was first discovered in U.K. glasshouses in the 1980s, where it caused devastation throughout hundreds of different plant species. The life cycle of the Thrip pest is variable with many different stages, all becoming more rapidly affected through a rise in temperature. Control of this insect is very difficult, but a recommended procedure is to carry out carefully timed applications of a systemic insecticide over a period of three weeks. This will affect and eradicate one generation of insects, which should alleviate the problem. Beware that excessive use of one type of systemic insecticide will cause the pests to become immune to its effects. There are now biological controls widely available for use with some pest species, some even available by post, ordered over the Web. These consist of small colonies of live predators which you release into your greenhouse. The predators will then breed and feed on the damaging plant pests. There are specific instructions on how to use the biological controls and these need to be taken note of for positive pest eradication. Your greenhouse needs to have just the right environment and conditions for the predators to thrive, continuing to feed on the insects until all of them are dead and your infestation has been taken care of. These predators will then die off leaving a healthy plant environment. 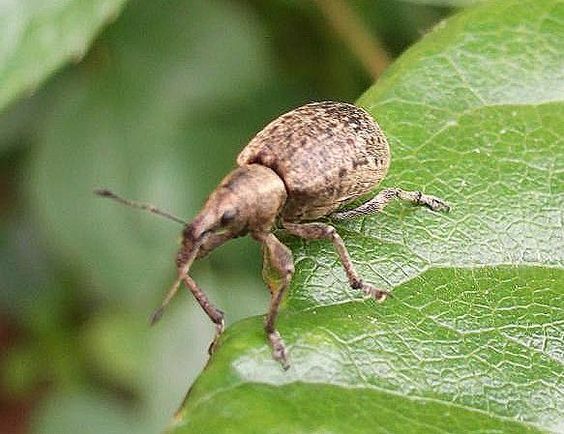 The biological control of Vine Weevil is available as pathogenic nematodes which are watered into the soil.